An extensive review of all the latest donor management software to determine which best fits your needs. Debra Berg interview on the ways to launch your cause. Learn the basic steps to nonprofit start-up and what questions to ask yourself as you're considering launching a new initiative. Features new areas of effective revenue generation to help your cause make it through challenging times. Not sure how to make a difference in your community? Need some ideas to get started? You never know, one volunteer activity can lead to bigger ways to make a difference. This is also a good way to see if your passion for a cause is as strong as you think. There are plenty of ways on this list to use your skills so you might try more than one! Discover the Perfect Volunteer Opportunity for You! Helps you discover how to begin exploring your options for volunteering and find the experience that fits your interests and schedule. Seeking a strategy to identifying the best volunteer experience for your family? This will get you started! Thought about telling your nonprofit’s story via self-publishing but not sure how to go about it? This article tells you why you shouldn’t wait and gives you the first steps to making it happen. 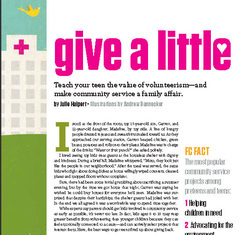 Teen Volunteer Tips by Debra Berg. Bidding For Good top 10 recommended and current tips for success based on running 13,000 successful fundraisers. Visit: http://www.selfgrowth.com/charity_articles.html at SelfGrowth.com for dozens of free articles on the topics of nonprofits, charities, and volunteering.